Apple and Google may both enter the video game console wars. 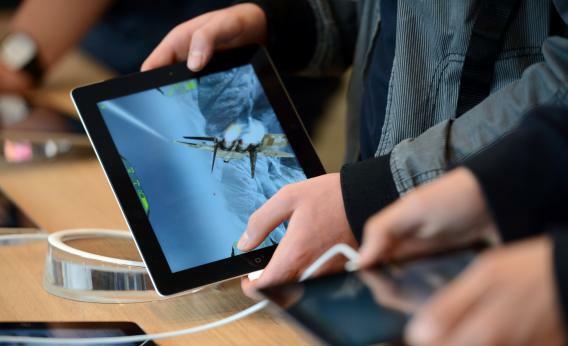 IPad games have caught on, but should Apple enter the console business? It wasn’t supposed to happen like this. The console wars were supposed to be a funnel, narrowing until we arrived at the PlayStreamBox U, a single, all-in-one platform that offloaded graphics processing to the cloud—no more disks!—and let us play everything from Mario to Halo with the same controller. We may still, one fine day, join hands around one console, the kind of thing Microsoft was pretending it had already made when it named the Xbox One. But for the moment (and the next five years), we don’t have one console. We’re not even looking at two, the Xbox One and PlayStation 4 that everyone’s paying attention to. We’re looking at six. Maybe seven. I don’t have enough glucose in my brain for this. To wit: Thursday night the Wall Street Journal reported that Google is developing a video-game console built on its Android operating system, to go along with an Android wristwatch, in furtherance of Google’s eventual goal of outfitting us head to toe in its e-apparel. “The Internet giant hopes to design and market the devices itself and release at least one of them this fall,” the Journal reports. Apparently Google is concerned that Apple is intent on installing its own console in your living room and slapping its own watch on your wrist. It’s unclear exactly why Google and (presumably) Apple are opening fronts in this crowded, decade-long war. Is it just that everybody’s making a “living room machine”—something for people who don’t identify as gamers to watch Netflix on? Perhaps their executives figure that their living room machines might as well have a controller attached because they both already have huge game libraries. But those libraries mostly contain smartphone and tablet games, and if I’m at home, I’m gonna use the big screen for a game/movie like Final Fantasy XV. That will require the processing power of the PlayStation 4 and Xbox One, which will cost hundreds more than an iGame or Googlebox, if Apple and Google are wise. If, on the other hand, Google and Apple are making true consoles instead of Hulu machines, it’s likely an overreaction to the Ouya, a $99, Android-powered console that launched this week. The Little Console That Could, which surprised everyone (including its creators) by raising $8.5 million on Kickstarter and is pronounced something like this, may dry up in the searing heat of the hype, but it has something the tech giants don’t. As Forbes points out, “the Ouya is a piracy goldmine, allowing even users with a fractional amount of tech knowledge to get access to emulator roms of nearly every old video game in existence.” Why pay $5 to download Super Mario Bros. on the Wii U when you can play it for free on the Ouya? And why buy the Google or Apple machines, neither of which will even feature gaming’s eternal mascot (unless Nintendo throws in the towel as a hardware company)? Because Mario doesn’t matter as much in a world where the most prolific game devices aren’t primarily for gaming. Apple and Google made gamers out of bored commuters; their set-top boxes can serve as a place for TV-watchers to stumble upon products like XCOM: Enemy Unknown, a sort of amped-of version of chess that’s making a splash on the iPad but is pretty enough for your HDTV. Either way, with Google getting into the console business,and Apple getting back into it, and Valve releasing its Steam Box, a bridge between the worlds of PC and console gaming, we’re in for a bloodier war than anyone expected. Man your battle stations, and chug one of these on your way to Best Buy this fall.